Simple, quick, and easy to use, the NAMA Claws by NAMA Gear are an upgrade to Prusik knots for attaching a tarp to a continuous ridgeline. I’ve been using these for months now and really like them, even in the cold when gloved hands often make it difficult to slide Prusik knots. The claws are made from stainless steel and weight just 3.5 grams each. NAMA Claws are designed for use with 1.75 mm dyneema line, but will work well with line diameters ranging from 1.2mm up to 1.8 mm. They are sold individually for $3. Buy a pair! These things work. Have been using them for about 8 months now. I have converted all my tarp ridge lines to using NAMA Claws. I left a set out in the weather for a month and there was no corrosion ( they are made of SS ). Lowest temps I have used them to is 11 degrees. 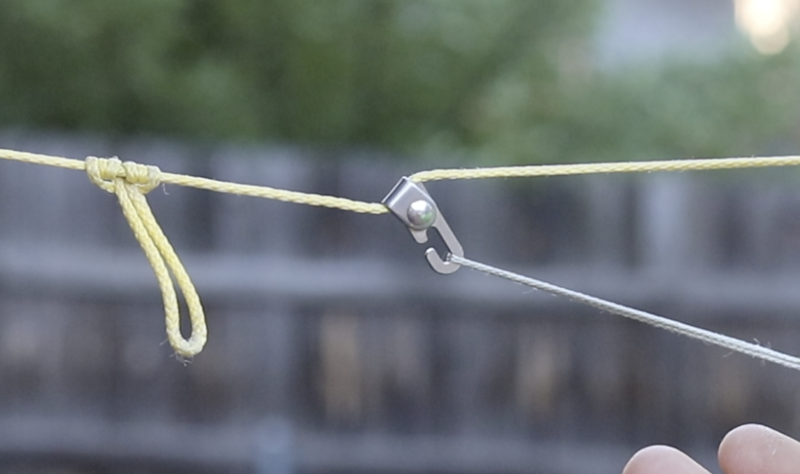 Why would you use the continuous ridgeline w/ Mama Claws if you don’t have the ability to adjust the tarp location without losing tension in the tarp? I thought that the ability to reposition the tarp was the key advantage of the continuous ridgeline. Am I missing something? It makes more sense to tie the end of the tarp directly to the tree & use Nama Claw to tension it. This will eliminate the ridgelines over the tarp & save the weight. The claws are pretty light so the weight penalty is low, but if you want to save a few grams by cutting away line then you can do end only tie outs. There are many more advantages of a continuous ridge line besides the adjustment.